Extra Long Size I - SHIPS FREE! Extra Long Size II - SHIPS FREE! Extra Long Size III - SHIPS FREE! Extra Long Size IV - SHIPS FREE! Extra Long Size V - SHIPS FREE! Extra Long Size VI - SHIPS FREE! Long Size I - SHIPS FREE! Long Size II - SHIPS FREE! Long Size III - SHIPS FREE! Long Size IV - SHIPS FREE! Long Size V - SHIPS FREE! Long Size VI - SHIPS FREE! Medium Size I - SHIPS FREE! Medium Size II - SHIPS FREE! Medium Size III - SHIPS FREE! Medium Size IV - SHIPS FREE! Medium Size V - SHIPS FREE! Medium Size VI - SHIPS FREE! Short Size I - SHIPS FREE! Short Size II - SHIPS FREE! Short Size III - SHIPS FREE! Short Size IV - SHIPS FREE! Short Size V - SHIPS FREE! Short Size VI - SHIPS FREE! Juzo Dynamic Above the Knee Stump Shrinker with Hip Attachment, manufactured by Juzo, are Amputee Stump Shrinker Socks that are designed to maintain the shape of the stump through a mild compression. These Juzo Stump Shrinker socks feature a hip attachment that makes wearing a compression garment easier than ever. You will not need to re-adjust this stump shrinker throughout the day. These Juzo Stump Shrinkers are ideal for those with sensitive skin, because the lay flat seams reduce irritation caused by pressure at the seams. These Juzo Stump Shrinker amputee compression sleeves are soft to the touch and comfortable to wear. 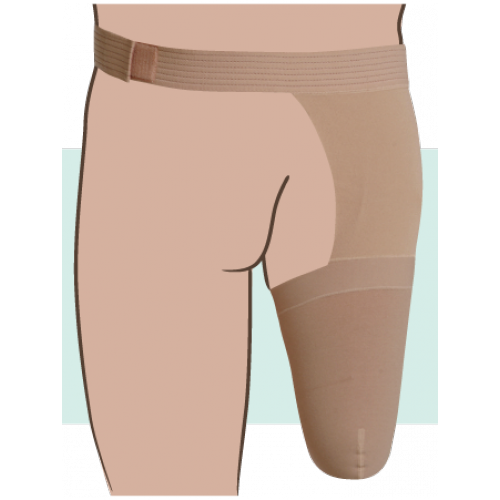 These Shrinkers for Amputation have a 20-30 mmHg compression rating, perfect for mild compression treatment. 30-40 mmHg compression shrinkers are also available. Hip Attachment Keeps Stump Shrinker Sock in Place. Lay Flat Seams Reduce Irritation. Juzo Dynamic Shrinker for Amputation Product Numbers: 3511FGSHAI, 3511FGSHAII, 3511FGSHAIII, 3511FGSHAIV, 3511FGSHAV, 3511FGSHAVI, 3511FGMHAI, 3511FGMHAII, 3511FGMHAIII, 3511FGMHAIV, 3511FGMHAV, 3511FGMHAVI, 3511FGLHAI, 3511FGLHAII, 3511FGLHAIII, 3511FGLHAIV, 3511FGLHAV, 3511FGLHAVI, 3511FGEHAI, 3511FGEHAII, 3511FGEHAIII, 3511FGEHAIV, 3511FGEHAV, 3511FGEHAVI. 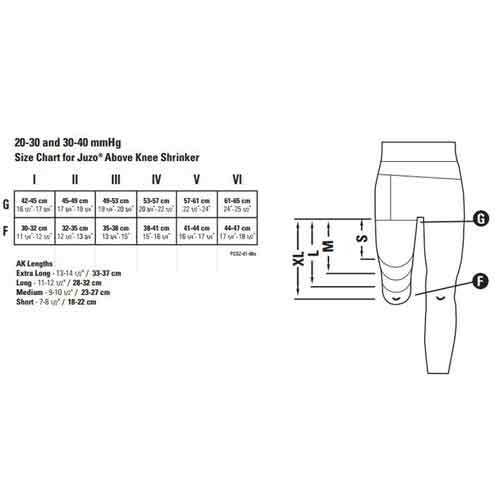 A size chart has been added for convenience.